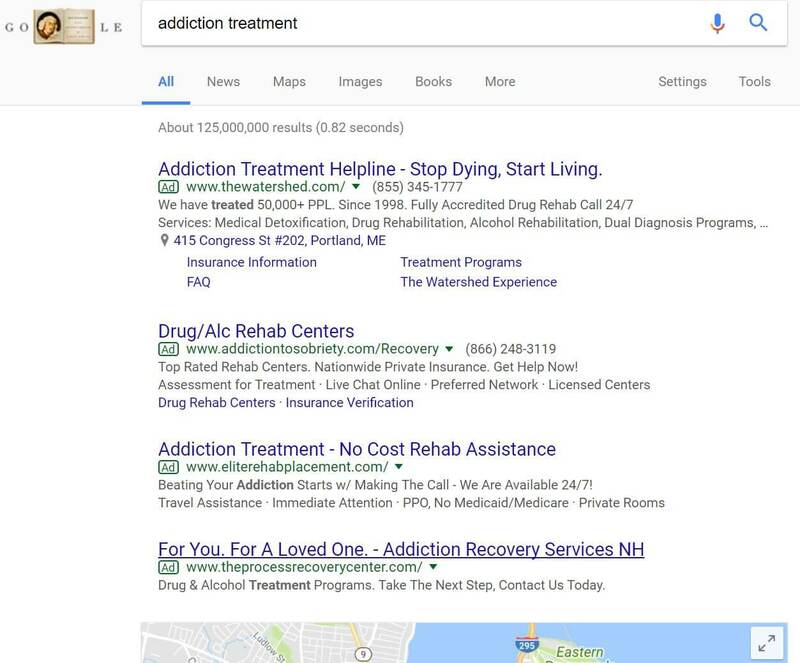 Beginning last week, Google started limiting ads on search results pages for drug and alcohol treatment center queries. Rehabilitation centers like those operated by Advanced Recovery Systems have suddenly seen ads disappear from roughly 40 percent of queries they were targeting, reported The Verge. 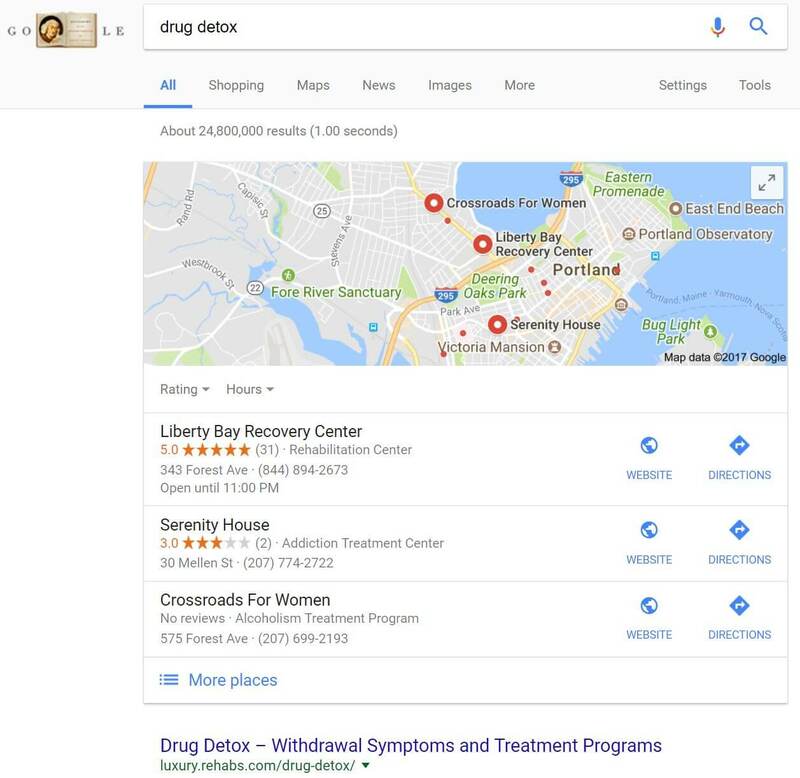 Searches for “drug detox,” “drug rehabilitation” and “drug treatment program” are some of the queries that return results without ads. Where text ads once appeared, a pack of organic local listings may display at the top of the search results page when available. There are still ads appearing on many rehab-related queries, such as “addiction help,” addiction rehab” and “painkiller detox.” That is likely to change, however, as this update rolls out. Ads appear on a search for “addiction treatment,” but that may change with this update. That leaves legitimate treatment centers in a kind of limbo, with potential for visibility and traffic from Google search ads to be limited further as the rollout continues. This change only impacts ads. Organic results are unchanged, other than appearing higher on the page when ads are disabled. With the worsening opioid addiction crisis in the US, demand for treatment programs has surged. A lack of regulation and treatment standards, coupled with outsized demand and new insurance mandates, creates an environment ripe for abuse. “We found a number of misleading experiences among rehabilitation treatment centers that led to our decision, in consultation with experts, to restrict ads in this category. As always, we constantly review our policies to protect our users and provide good experiences for consumers,” a Google spokesperson said. One of the groups Google has been consulting is Facing Addiction, a non-profit resource for people seeking treatment. “We have been having discussions with Google for the past few months. As you can imagine, this is an extraordinarily complicated conversation, with many moving parts,” said Jim Hood, Facing Addiction co-founder, in an email. Facing Addiction undertook a comprehensive analysis of how much money addiction treatment service providers and lead generating companies in the field pay to advertise the facilities in Google search results. With the current economics of treatment care, it is worth paying almost anything for a lead, because just a small percentage need to convert into paying patients to make it well worth the marketing costs, says Hood. In other words, patient care becomes a secondary concern. This isn’t the first time Google has changed the way it handles ads for a specific category of services to address abuse. In part in response to numerous problems with fraudulent locksmith ads, Google instituted a verification process and launched an entirely new ad product called Home Services Ads for locksmiths and other local service providers. In July 2016, Google instituted a ban on payday and high-interest loan advertisers. In 2011, the US Department of Justice levied a $500 million fine on Google for having allowed Canadian pharmacies to target US consumers with search ads for a period of time before the company banned such advertisements. Unlike the pharmacy and payday loan scenarios where ads can still appear on related queries, Google is disabling advertising on certain addiction treatment-related search results altogether — for now at least. This could evolve as Google works with outside advisors and experts in the field. The goal is to ensure that consumers turning to Google to search for help only see ads for reputable resources. That’s a complicated effort that will take time. It also puts good actors that have relied on Google as a lead source in a tough and unpredictable spot. Advertisers are likely to see a continuing drop-off or fluctuation in ad impressions as Google works through its response. Ads could be gone for good on these queries, but it’s conceivable an alternative solution will arise.